The 26th Men’s Southbroom Amateur Classic was played from 4th – 8th July 2016. It was a fabulous tournament, enjoyed by all!! The 26th Southbroom Amateur Classic was a great success with 160 golfers from all around the country competing for the Trophy over 4 days. Many of the players comment on how wonderful it is to travel to the South Coast with their families, escaping the cold Gauteng winter and play in such a fun and competitive event. The first two days were fairly cool and breezy with a north wind, but clear and bright. The greens were running at 10.4 on the stimp meter, so pretty quick and that made good scoring a challenge. A great exception was young Cyril Botha from Mossell Bay who plays off a 1 and who shot a gross 63 on a chilly Tuesday morning for a super score of 47 points with his partner Johan Schnetler. 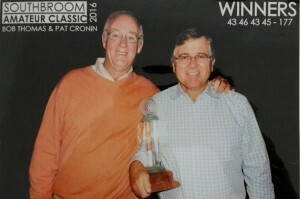 Bob Thomas and Pat Cronin were the defending champions and were as solid as ever with scores of 43 and 46 to tie for the lead after 2 days. Wednesday blew a howling gale so most players were quite relieved as it was their day off, though some headed for Wild Coast and San Lameer to enjoy more golf. The final two days brought on beautiful weather, especially Friday where the sea looked like glass and the scoring responded with 50 points from Dries Barkhuizen and Johan Erasmus together with a number of 49’s & 48’s. With the final day to play – the Leader board was bunched with many teams in the hunt.It all came down to the last hole where Pat Cronin made a spectacular up and down to beat the steady team of Ig Erasmus and Rudie Venter by one shot. Our thanks to Barry Elliot of Hibiscus Brokers for his ongoing support and umbrella sponsorship of the Tournament and a huge Thank you to all the players, the many sponsors and the Southbroom Team who helped create a wonderful Tournament. Thanks to the Jeep Boys for adding their energy as always and prize sponsorship. This year Comexas Afrique, Member Xavier Pollet sponsored the evening entertainment, which was fabulous. The Southbroom Legends Band played on Sunday, Dix Vorster was a popular choice for Thursday Evening and Winston Smile wowed the bar with his versatility on Sunday evening. Thanks Xavier. Click here to be placed on the 2017 invitation list – Monday 3rd to Friday 7th July 2017.